Over the course of last season, leading Premiership Rugby teams such as Exeter Chiefs, Wasps and Saracens built up a momentum and a sense of self-belief that made them almost unstoppable. In rugby, as well as in business, it’s clear that winning inspires a winning attitude; propelling teams to win more and more games. It’s evident that a winning attitude in business is just as important for success. So how can businesses give their employees this winning mentality, and reap its benefits? 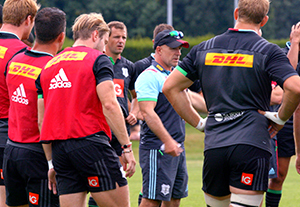 Leaders that inspire organisations to achieve their goals can build momentum and create a winning culture in a similar way by replicating a lot of the strategies used by rugby coaches. Define what you stand for early on, and live those values every day. This means sticking to your core beliefs through every communication, and instilling the same values in your team. Focus on the team rather than individuals. It may be tempting for leadership to take responsibility for an organisation’s success. But employees must also be allowed that ‘winning feeling’. Building a genuine company-wide sense of achievement creates momentum that comes from shared success. All rugby coaches will tell you that winning doesn’t come without an environment of trust. Internal trust between team members ensures that you always have a strategic advantage. Without it, speed diminishes and costs go up. Employees build trust by feeling part of their organisation’s success. To do this, you must give them a sense of involvement in the decision-making process. Most importantly, a culture of winning comes from a focus on results. To shape the right culture, measuring performance and learning from mistakes along the way is vital. ‘Winning’ isn’t straightforward without relevant insight. When employees have confidence in their leaders, strategic process and goals, they will share a winning mentality. Winning will then lead to winning, just as it did for Exeter Chiefs last season.